Prior to unpacking the server from its shipping container, ensure that you have provided enough space to unpack the server. Refer to the Unpacking Guide, which is attached to the shipping carton, for the unpacking instructions. Caution - You must provide 10 ft (3 m) as a stopping zone to slow and stop the server after it rolls down the shipping pallet ramps. Failure to provide this stopping zone could lead to equipment damage or serious physical injury. 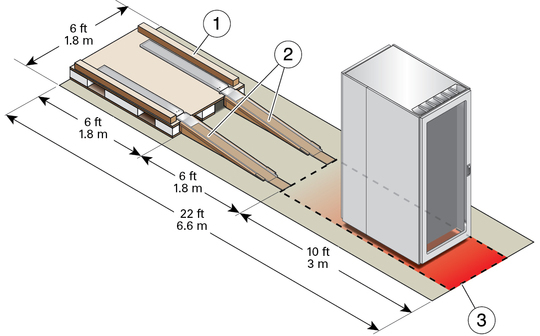 Note - Remove the shipping container in a conditioned space away from the final installation site to reduce airborne particles entering the data center.